Facebook, the world’s largest networking site with over 500 million members, launched a new messaging system Monday, taking various communication platforms like E-mail, SMS, instant messaging, and chat and integrating them into what is called Facebook Messages. The system is a result of a 15-month engineering project, considered by many as the largest Facebook has undertaken. Facebook Messages is actually a revitalization of its current messaging system, and – despite industry observers and news media hyping the new feature as an “E-mail killer”, intended to rival Google’s highly popular Gmail – it isn’t technically a new E-mail platform. What Facebook Messages does provide are three unique communication features, which served as the highlights of Zuckerberg’s Monday announcement. Conversation history: Regardless of whether they’re communicating via E-mail, IM, SMS, or chat, Facebook users will soon be able to chart entire conversation histories with friends and contacts. These histories are organized primarily around people. Social inbox: Facebook Messages also introduces the idea of having a social inbox, one which prioritizes the messages of key contacts and friends over messages that come from strangers (and non-friends). Just like in the actual Facebook application, the settings of Facebook Messages can be customized and changed to keep unwanted messages from making their way into this social inbox. Reads the official blog post: “Instead of having to worry about your E-mail address going out, you’re now in control of who can actually reach you.” Depending on one’s Facebook Messages settings, spammers and strangers can be prevented from making unsolicited contact. Facebook Messages has been rolled out on an invitation-only basis; in time, though, the company will provide every Facebook user with one @facebook.com E-mail address, determined according to username / Facebook URL. (For corporate messaging, meanwhile, the company will be using the FB.com domain.) The new system also integrates Microsoft’s Office Web apps, which should enable users to view Word, Excel, and PowerPoint attachments without leaving Facebook Messages. As mentioned, Zuckerberg has made it clear that Facebook Messages is not E-mail. There are no subject lines and CC and BCC fields; also, one can send a message simply by hitting the Enter key. 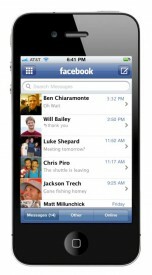 What do you think of Facebook Messages? Are you going to embrace this new messaging platform, which pretty much blurs the lines of E-mail, SMS, and chat? Or are you hesitant to let Facebook – notorious for being dogged with privacy complaints – handle your most personal and important chats, conversations, and correspondences? Let us know by leaving a comment below!